I think everyone knows what "ykywtmsmw/ykylsmtmw" is. So, I welcome to post new ideas here. 1. You believe that Christian "Serenity Prayer" actually is addressed to Neo Queen Serenity. there is a long list of ykywtmsmw entries (around 800) in German language not included as yet into the Ykywtmsmw compilation (mentioned above). I don't know German language so I cannot translate it myself. It would be great if anyone knowing that language can tranlate it for everyone else. Seriously? I would download it if you did. You and Anton remind me of someone on YouTube whose username is anneliese22. You have a lot of good work ethic that you use to help the Sailor Moon community. anneliese22 has posted all of the S and SS seasons, part of R, and part of Stars. She is working on Stars and will post the rest of R and even the original if people want her to. Since YouTube has been deleting a lot of anime, she has put the playlists on private and given instructions to everyone for adding her as a friend and being able to view these videos. She has also promised to keep uploading Sailor Moon if her videos get deleted or even on another profile if her current one is suspended. Anton, you have put together this forum and the Sailor V Game site, and Kasumi, you have a fan site, have promised me a Mercury/Ami-chan avatar (thank you so much), and have offered to translate this list. I don't know what us moonies would do without people like you two. *sniff* You guys are great! *sigh* Hope to be back after school's out! Yay, Super Sailor Venus, the best senshi ever! 2. Your dreams are cell-shaded. Isn't there by chance someone willing to translate the above mentioned 800+ entries from German to English? I'll give some of it a go. I think I can figure it out, or if not, make a few VERY good guesses. I could try it too. Never underestimate the power of love! This are some of them that i translated. ...You learn all day long so that you can be smart like Ami-chan. ...you try to convince your parents that your little sister isn't really your sister, and that she just hypnotizes you. ... You r going to Anime-meeting in your Sailor moon costume, then you saw somebody with exactly the same costume as yours and then you say: "You won't get off with this, Zoicite!" ...you r in Iran on vacation and every man you see with a white mask on his face you ask: "Is that you Tuxedo Mask?" ...when you see that outside is a nice sunny day and you r in house and watch Sailor moon...you just take TV outside. ... You throw the stove in air and you shout: "Fire Soul!" ...you start to learn Japanese so that you can watch the original series. ... When you turn your computer on the startup music is set on "Moon Prism Power". ...you draw a bunny on your lunch pack. ... You take a bus only when you r transformed in a stewardess or a kindergarten teacher. ...you go to meeting places but only when you r armed with soap bubbles things. ... You suggest Reinhold Messner if he want to go with you on North Pole, so that you can fight against the evil. ... Every time when you go on Street Parade you hope you will discover a Sailor Senshi, just because she has a blue hair or wearing some hair accessories. 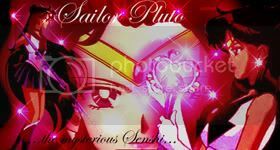 ...you saw God in your dreams and he said to you: "No I won t make a Sailor Senshi of you! So stop bothering me!" ... Your best friend believes that you like Sailor moon more then her. AND SHE HAS RIGHT! Yeah, splitting them would be a good idea, then I could help, too. All 813 would simply be too much for my poor brain. Yeah, splitting them would be a good idea, then I could help, too. All 813 would simply be too much for my poor brain. ...you stick yellow tights to your hair only to look a bit more like Usagi. ...You think your father is evil Dr.
...You try to teach your Astronomy teacher where the planet Nemesis is... And actually succeed to convince him! ...You scream at your ex in anger: "In the name of the Moon, i'll punish you!" ...You cancel all your dates on Saturday evening and decide to spend the night with chinese food, watching Sailor Moon DVD's until you meet your father at 6 am in the morning on the way to toilet and scream in his face: "In the name of the Moon, I'll punish you!" ...You keep screaming: "Moon Tiara Action!" ...You wrap yourself in a white sheet, to look like the Moonlight Knight. And while you talk, you put a hand over your mouth, to sound exactly like him. ...You stick a moon on your forehead and insist on being called "Princess" or "Serenity"
...You spend hours looking for a fanfic on the net that you had accidentally found before, and then yell because you can't find it: "In the name of the Moon, I'll punish you if I don't find that fanfic!" ...You buy a motorcycle exactly like the one Haruka has, and then crash as soon as you get on because you don't know a thing about motorcycles. Yeah, good idea it would be much easier when we split them. Well you r fast silver-eyes :shock: did you count them or what? Actually, I copied them all into Word, selected the text, and added the "enumerate" option.